Williamsburg, Crown Heights, & Borough Park are Brooklyn's Hasidic centers. But there's much more to "Jewish Brooklyn" or "Jews in Brooklyn"
Brooklyn has a long history of Jewish residents, with synagogues founded in the mid-19th century, various waves of immigration (from Germany, Eastern Europe, and the Middle East) and outflow, and, notably, Hasidic Jews coming as refugees in the 1940s and 1950s after the Holocaust, building communities that have since grown enormously. So "Jewish Brooklyn"--meaning neighborhoods where the population is mostly Jewish--is vast: it includes the four neighborhoods listed at right, which include the most observant Orthodox and Hasidic communities, and attendant schools, shopping, and kosher restaurants. Please note: each of these neighborhoods has gone through significant change. They grew in the early 20th century as immigrants moved from the Lower East Side. Within one or two generations, the neighborhoods changed again, replenished in several cases by refugees from the Holocaust or by an increasingly haredi presence. In other words: there is no direct line between current day "Jewish Brooklyn" and the families of many Americans who trace their Jewish history to the Lower East Side immigrant gateway. Nor is there today a single Orthodox Jewish community or Hasidic community. Please note that Hasidic Jews are Orthodox Jews, but Orthodox Jews are not necessarily Hasidic Jews--both keep strict adherence to Jewish law and the Jewish calendar, the latter draw on the Jewish mystical tradition, follow a spiritual leader (rebbe), dress in a distinct fashion, and act as a group. The tours I lead/devise are neighborhood tours, not "insider" tours that will take you into a scribe's study, as in the Chabad tour of Crown Heights. If you want a particularly frum experience, or a significant Jewish studies component, I'm not your guy. Most of my clients want an introduction to these neighborhoods. So our tour includes visits to major shopping streets and the opportunity to stop in bakeries and Judaica shops. We walk past major institutions like synagogues and yeshivas. And we learn how these neighborhoods have grown and evolved. Please note: for those who are visiting Brooklyn for the first time, I strongly recommend not limiting yourself to Jewish Brooklyn but rather combining it with other parts of Brooklyn. (Otherwise, you miss a lot). See Option 1 below, which has several variations But if you would like to focus only on Hasidic Jewish Brooklyn, then Option 2 is the easiest to accomplish in a shorter amount of time: it combines visits to Crown Heights and to Williamsburg, which have contrasting Hasidic communities. Also, do recognize that Brooklyn contains Jewish life in many forms, with synagogues (reform, conservative, orthodox) in many other neighborhoods, as well as a historic or current Jewish presence. All three of the neighborhoods below have had an evolving Jewish population. Williamsburg includes a large, very traditional Satmar Hasidic enclave adjacent to a former tenement area, now gentrifying furiously, and other areas of significant redevelopment in a formerly manufacturing/warehouse zone. Wondering about Hasidic life in Williamsburg? Here's a down-to-earth AMA (ask me anything) from Reddit.​ Williamsburg is perhaps the most traditional of the communities. Crown Heights is home to the Lubavitcher Hasidic community, the Chabad movement, an enclave in a larger neighborhood of row houses and pre-war apartment buildings, that has an African-American and Caribbean-American majority. Crown Heights has a branch of the deli Mendy's at the Brooklyn Jewish Children's museum. It's the most modern of the Hasidic communities, given outreach ot other Jews and the embrace of technology; see this video on Hasidic fashion, including a visit to a wig store. 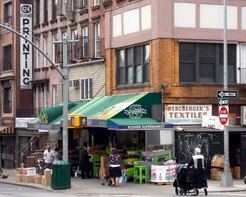 In southwest Brooklyn, Borough Park has the largest Hasidic population, as well as a Modern Orthodox population. While architecturally and historically less striking than Williamsburg or Crown Heights, Borough Park has the largest shopping district, with many stores and some restaurants. It is more pluralistic than either of the other communities, and larger. Please note: none of these neighborhoods are adjacent to each other. A walking tour that includes more than one neighborhood requires a bus or taxi or subway ride to connect the neighborhoods. See map at top right for sense of how these neighborhoods are placed in Brooklyn. These tours are walking tours, with the destination reached by public transit or taxi, and perhaps with a taxi ride in the middle. Doing the tour in a vehicle adds at least $50/hour to my fee to hire a car service. Also note: the Jewish neighborhoods are at least 30-45 minutes by public transit from Midtown Manhattan. Please dress modestly--we can discuss. No tours on Saturdays--it's the Sabbath/Shabbat. Option 1A/1B/1C: If you want an introduction to Brooklyn and see a piece of Jewish Brooklyn--which means we exceed 2.5 hours-- I can add a Jewish element to one of my listed tours. Option 1A: We can visit Jewish Crown Heights as a 60+-minute add-on to the 2.5-hour Brooklyn 101 overview tour. Total: 3.5-4 hours, depending on transportation and how fast we walk. Option 1B: We could visit Jewish Williamsburg as a 90+-minute add-on to 2.5-hour Brooklyn 101. Total: 4-4.5 hours, depending on transportation and how fast we walk. Option 1C: We could visit both Jewish Crown Heights and Jewish Williamsburg as an add-on to Brooklyn 101. That would be 5-6 hours. ​Note that those are not full visits to the larger neighborhoods of Crown Heights or Williamsburg. A full visit could extend the tours further. Also note that, if you want an even more comprehensive introduction, we could substitute the 4.5-hour Brooklyn 202 tour for Brooklyn 101. Option 2: Jewish Williamsburg and Jewish Crown Heights together, without any basic introduction to Brooklyn. We can spend 3 hours in these neighborhoods, walking the shopping streets, passing the synagogues, and yeshivas, and getting a sense of the history and forces that have transformed the notion of "Jews in Brooklyn" from secularizing immigrants to devout communities challenged by and (in different ways) confronting modernity. Option 3: Also over 3 hours, we can visit Jewish Crown Heights and nearby Park Slope/Prospect Park (which is a segment of Brooklyn 101). That means you don't get the full Brooklyn 101 tour. Park Slope, while not a religious Jewish neighborhoods, does have four synagogues (and many churches). Option 4: My 2.5-hour tours of Williamsburg or Crown Heights already include visits to the Jewish sections of those neighborhoods, though the bulk of each tour is outside those sections. Option 5: A visit to Borough Park includes a walk past the neighborhood's major synagogues (including that of the Bobover sect), which signal several layers of neighborhood change, stops in stores featuring Judaica and more, and a walk past a new hotel catering to religious visitors. This can take 1.5-2 hours, and be combined with other neighborhoods; Modern Orthodox Midwood is nearby. Further options: If you're a completist, we can see visit Modern Orthodox Midwood (in between Crown Heights and Borough Park), take a look at the Sephardic Brooklyn enclave around Kings Highway; or explore the Jewish remnants of Brighton Beach, now the heart of Brooklyn's Russian/FSU (former Soviet Union) community. Note: if you are new to New York, the Lower East Side could serve as your introductory Jewish tour. It contains numerous synagogues, including some converted from churches and some converted to churches or commercial/residential functions. It is not the center of Jewish life in Manhattan, but it was the historic gateway to New York City. It still contains some significant institutions and a small but not insignificant religious Jewish population. For information on fees, please click here.